Italian painter, known as Michele di Ridolfo del Ghirlandaio. He studied with Lorenzo di Credi and Antonio del Ceraiolo (fl 1520-38) before entering the workshop of Ridolfo Ghirlandaio. By 1525 he was frequently collaborating with Ghirlandaio, and their closeness is reflected in Tosini s adopted name. Tosini began painting in the early 16th-century Florentine style of Fra Bartolommeo and Andrea del Sarto (e.g. the Virgin of the Sacred Girdle, c. 1525; Florence, S Marco). His acceptance of Mannerism was slow, but by the 1540s the influence of Francesco Salviati and Agnolo Bronzino was observable in his work. 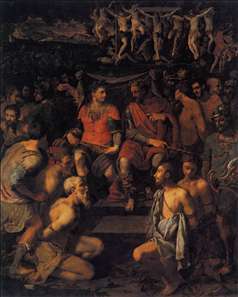 After 1556 Tosini worked for Giorgio Vasari in the fresco decoration of the Salone dei Cinquecento in the Palazzo Vecchio, Florence. Through Vasari s example, Tosini adopted a vocabulary derived from the work of Michelangelo and painted some of his best-known works in this manner (e.g. 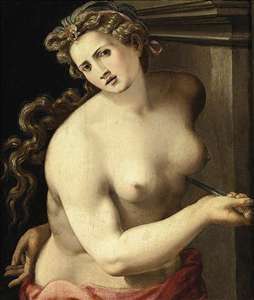 Night, c. 1560; Rome, Galleria Colonna, and Leda, c. 1560; Rome, Galleria Borghese). He executed several important commissions late in his career: the fresco decoration of three city gates of Florence (1560s), the altar in the chapel at the Villa Caserotta (1561), near San Casciano Val di Pesa, and the paintings on the sides and back of the tabernacle of the high altar of S Maria della Quercia (1570), Viterbo. According to Vasari, Tosini headed a large workshop that executed numerous altarpieces and paintings. See more details about "Lucretia"
See more details about "The Martyrdom of the 10.000"